Pompeii 1959 gained an international reputation in the 1960s, representing Hans Hofmann and his ‘slab’ paintings across the US, Europe and South America. 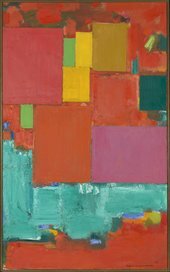 Pompeii is a large abstract oil painting made in New York in 1959 by the German-born American abstract expressionist Hans Hofmann. It is one of the artist’s ‘slab’ works, a type of painting that Hofmann developed in the last decade of his career featuring thick, built-up rectangles of paint surrounded by fluid fields of colour. This In Focus positions Pompeii as a key work in understanding Hofmann’s late paintings. It examines its travels around the globe – from New York to Venice, Buenos Aires, Caracas, Amsterdam, Turin and cities in Germany – and looks at the significance of Hofmann’s work in the critical writings of Clement Greenberg and Harold Rosenberg, who both made it the subject of their different definitions of abstract expressionism. It also considers Pompeii and other ‘slab’ paintings alongside Hofmann’s three mosaic mural commissions for a plaza and bell tower, a printing school and the foyer of a skyscraper. Finally, it explores Pompeii in relation to interior decoration, as seen in photographs of Hofmann’s own home published in contemporary magazine profiles on the artist. Published in February 2018, the project is authored by Emily Warner (Vassar College) with a contribution by Elissa Auther (Museum of Arts and Design and Bard Graduate Center).